One of the best ways to become more productive is to properly set your schedule by listing down the things that you need to do. If you have a personal organizer app like Jorte, then it would be a whole lot easier for you to manage and organize your tasks as well as your important events, reminders and memos. The Jorte Calendar for Android is a reliable and very handy personal organizer application that is created and developed by Jorte, Inc. With this app, you can easily create, manage and organize your daily, weekly or monthly events, reminders, tasks and memos. Not only that, this app also features a lot of customization options such as its customizable fonts, themes, wallpapers and icons. You can view your to-do list (aka task list) in a separate section. When creating tasks, you are also allowed to set your task’s start date/start time and due date/due time. Provides a wide selection of options for custom user settings – toolbar, widgets, view settings, notifications, etc. You can send and share your calendar as image via Bluetooth, Gmail, IM, SMS, Instagram, etc. It could take a while before you get used to its basic functions. There is a tendency for new users to get confused especially when they are trying to customize the app’s settings and appearance. What I like most about Jorte is its wide selection of UI customizations. You can easily change or customize its fonts, backgrounds, themes and icons. It also features a lot of options for creating and managing tasks, events, reminders and memos. So it basically has all of the important things that you need to manage your daily, weekly, monthly or yearly schedules and to-do lists. It’s just that with the free version, you are only allowed to use one private or custom Calendar (MyCalendar) so if you want to add more, you need to upgrade to its Premium version which will eventually cost you a one-time fee of $3.86. By purchasing the Premium version, you will also get some new sets of calendar icons. What’s great about this app is that you can easily switch between two or more calendars. So let’s say that you have your local Jorte Calendar and you also have your Google Calendar. So instead of viewing these calendars on separate applications, you can just sync your Google Calendar into Jorte and that’s it. You can even integrate a wide range of events and weather updates into your local or private calendar. 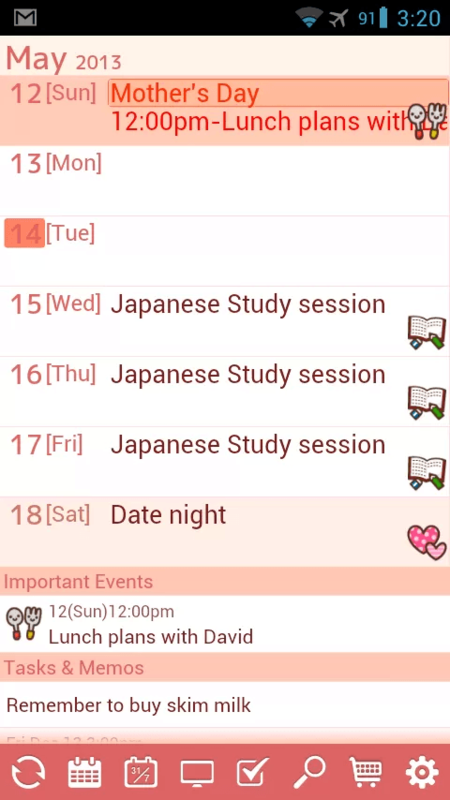 You can do this by simply adding a specific event calendar such as the Asia Weather Forecast, etc. Of course, you can localize your calendars so that they would match your city’s time zone and climate. I also like the fact that this app has a separate section for tasks. So when you go to its toolbar, which is located at the bottom of the screen, you will immediately see the “Tasks” button and when you click on it, you can immediately view your to-do lists. When creating tasks, you can also set the time, start date and due date. You can also set specific reminders for your tasks so that you’ll get notified whenever it’s already time for you to perform a certain task. While the Jorte Calendar looks simple and neat, there’s still a tendency for you to get confused especially when you want to change or update the app’s default settings and preferences. So my best suggestion is for you to take some time to play around with the app first. You can also read its FAQs section especially if you want to learn more about its basic operations. Nonetheless, I really don’t have any serious issues or concerns about this app. 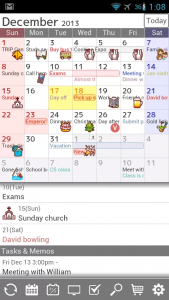 It is a very reliable personal organizer/calendar app plus it’s very stable. You can also sync your app via Jorte Cloud so that you could easily transfer your data to other devices. This feature will come in handy especially when you are using two or more Android devices. It’s just that I find it difficult to jump into specific dates because it doesn’t have a “Go to” button. Aside from that, most of its icon packs aren’t available for free download so you just have to make the most of what’s available. If you are looking for a great alternative for your phone or tablet’s default calendar app, I suggest that you try Jorte. 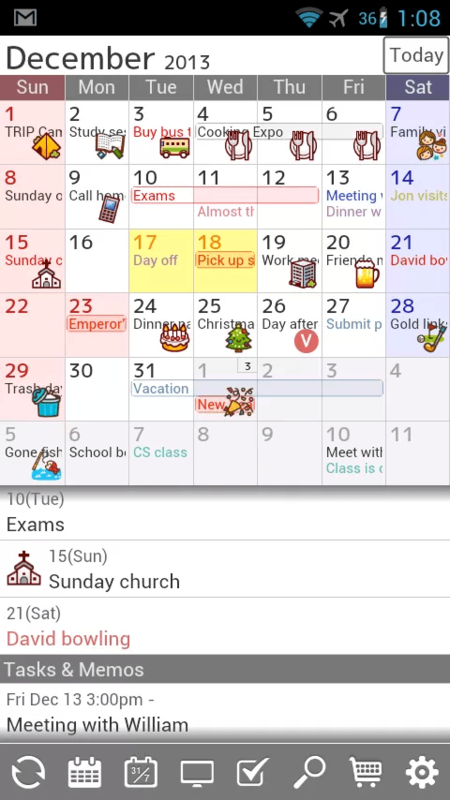 This app features a combination of tools and functions that you cannot easily find on today’s most commonly used free personal organizer and calendar applications. Its free version may have some limitations but this doesn’t really affect its overall functionality. You just need to take some time to acquaint yourself with its basic operations.